ALL CLASSROOMS ARE FULL. PLEASE FILL OUT A "WAITING LIST" FORM TO GET ON THE LIST FOR POSSIBLE OPENINGS IN THE FUTURE. Friday, March 1st, starting at 9 am. This is for NEW​ students only. If you have any questions, please call our office at 830-774-0628. Thank you! The Day School is designed to meet the needs of young children by providing a safe caring Christian environment in which children develop physically, intellectually, spiritually, socially and emotionally under the guidance of caring teachers. 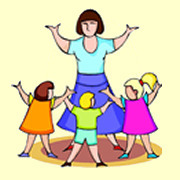 The Day School uses a curriculum designed specifically for toddlers and preschool aged children. We allow children to explore the world around them through hands on activities, creative art, block play, dramatic play, math, science, music, and religious education. We have chapel time on Tuesday's and music time on Wednesday's. The children have playground everyday. In addition, we incorporate Christian education during our daily activities and lessons. We sing Bible songs as a part of our music curriculum and we say grace before mealtimes, and encourage the Bible's teachings. Above all else we strive to make the Methodist Day School filled with FUN! Call or stop by to register! We want to be a blessing to you and your child! follows the SFDRCISD school calendar. Classes start at the end of August and end in May. *Classroom enrollment depends on the age of your child as of September 1st of that school year.